2 beautiful collage sheets FREE with your 25.00 purchase! Vintage Elements 250 Artist Trading Coins Collage Sheet & Thanksgiving 12 Collage Sheet free with your 25.00 purchase. Offer starts today and ends Sunday Sept 30, 2018 @ 3 pm CST. Vintage Elements 250 Collage Sheet 9 has different "Coins", there are also 3 small circles that are about 1-1/2" in diameter. The "Coins" are circles of vintage patchwork the colors of autumn. Punch out the circles with a 2-1/2" circle punch and add collage images, rubber stamping, words, paint, or ink. The Thanksgiving 12 Collage Sheet is an allover pattern with leaves of every type in all of the colors of fall. Make a pretty autumn book with this paper as the cover. And don't forget - if you have time - to make some happy mail cards & tags! 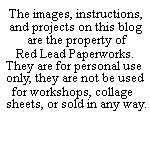 Red Lead collage sheets are professionally laser printed in the USA on 8-1/2" x 11" archival quality paper. Our collage sheets will not run or smear when you use any medium of your choice for gluing or sealing.